The Mule Pro FXT has only been available for a short time now, and we already have our new products designed for it! Many DEALERS have yet to even receive a new Mule PRO as of yet. We already have our unit in-house, and have products designed for it! In addition to our windshields and tops for this machine, we are now adding a very versatile (and very affordable) under seat storage compartment! NOW SHIPPING TO A KAWASAKI DEALER NEAR YOU! As is the case with most UTV vehicles, sometimes inside, dry storage space is somewhat limited. This is no exception with the Mule PRO FXT. The only dry storage is the small interior glove box on the passenger side of the vehicle. 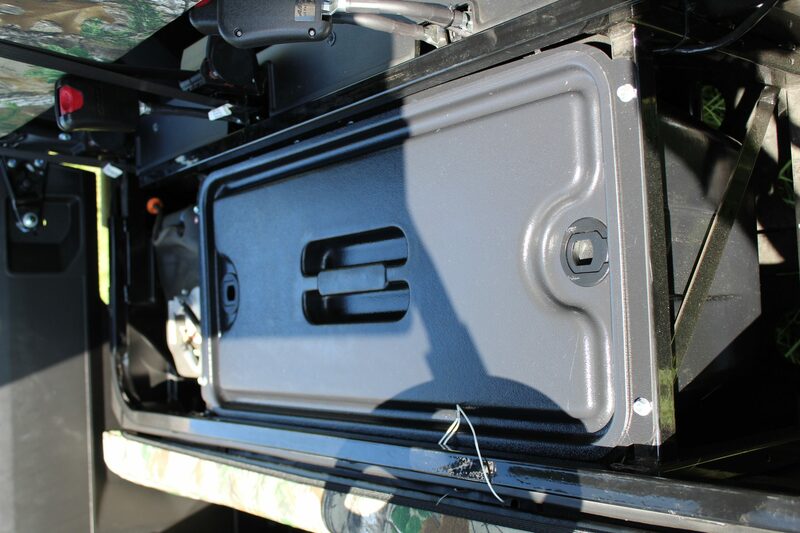 We are now offering a LARGE interior storage compartment that will fit underneath the entire front seat. Simply lift up the front seat and easily access our new compartment. Quickly install this new storage compartment for another 396 cubic inches (or almost 2.5 cubic feet) of additional storage! Simple tools required for installation, all within about 2-3 minutes. Uses (2) small quarter-turn fasteners to secure the lid to the storage box. Built-in drain plug, in case you ever need to use the box for an ice chest. This is a REALLY useful addition to your new Mule PRO-FXT.